A day after Delhi recorded its first severely polluted day, the air quality improved to very poor category on Wednesday. Air pollution experts, however, said the coming week will see high levels of particulate matter and toxic gases. 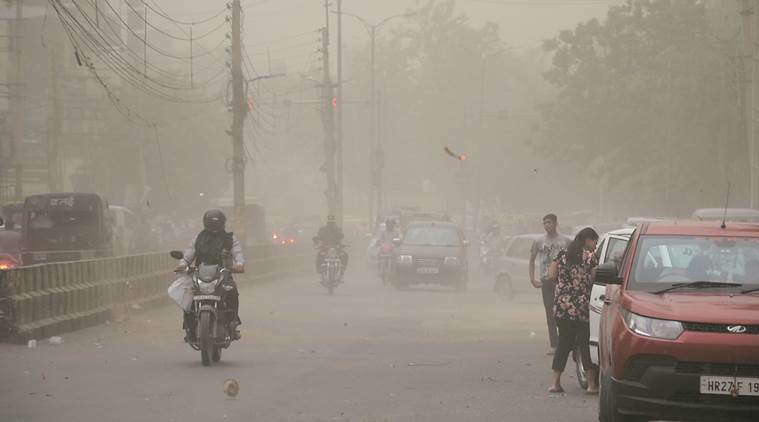 System of Air Quality and Weather Forecasting and Research (SAFAR) said the coming 10 days are expected to see a sharp deterioration of air quality in Delhi-NCR. “This is due to a western disturbance system in the north of India which is bringing moisture and a cyclonic system on the eastern side which is suppressing winds. There is also the increased burning of paddy straw in Punjab and Haryana, evident from images released by NASA. The direction of the wind is now from the northwest. All this, combined with Delhi-NCR’s own pollution sources, could lead to a spike in pollution in the coming 10 days,” the agency said. Particulate matter concentration increased manifold Wednesday night. At 9 pm, the PM 10 concentration at India Gate was recorded as 705 µg/m3, seven times higher than the acceptable limit of 100 µg/m3 . PM 2.5 was recorded as 272.0 µg/m3, over four times higher than the acceptable limit of 60 µg/m3. At Anand Vihar, among the most polluted places in Delhi, the PM 10 concentration was 849 µg/m3 and the PM 2.5 concentration was 272 µg/m3. The air quality improved slightly Wednesday, because of a slight uptick in wind speed in the early hours.